I bought a magnifying glass with light and can barely see more than 2-3 open glands. I've got a specialist appointment next week, so I'm preparing for the possibility that my glands have died.This is a research blog post – collecting relevant information on this subject from the internet. Can you see MG with the naked eye? In brief, they ought to be visible with a magnifying glass but not with the naked eye. How many glands are normally fully productive? Why would one's meibomian glands die? How does one know that one's glands are dying? Chronic inflammation is an inflammatory response of prolonged duration – weeks, months, or even indefinitely – whose extended time course is provoked by persistance of the causative stimulus to inflammation in the tissue. The inflammatory process inevitably causes tissue damage and is accompanied by simultaneous attempts at healing and repair. The exact nature, extent and time course of chronic inflammation is variable, and depends on a balance between the causative agent and the attempts of the body to remove it. Dead cellular material and debris are removed by phagocytosis (mainly by macrophages) and the tissue is left with its original architecture intact. Lost tissue is replaced by proliferation of cells of the same type, which reconstruct the normal architecture. Lost tissue is replaced by a fibrous scar which is produced from granulation tissue…..Fibroblasts migrate into the damaged area along with the capillaries to form a loose connective tissue framework. This delicate fibrovascular tissue is granulation tissue. Blocked MG being probed by a doctor. See details here. Dr. Maskin developed instrument prototypes to test his theory and used these investigational designs (with proper informed consent) on some of his MGD patients. His findings were a breakthrough in the understanding and management of MGD, he says. First, he found that he could easily enter the MG and, with the probing technique, immediately and dramatically relieve symptoms. Secondly, he found through probing that the conventional understanding of MGD was "incomplete at best. 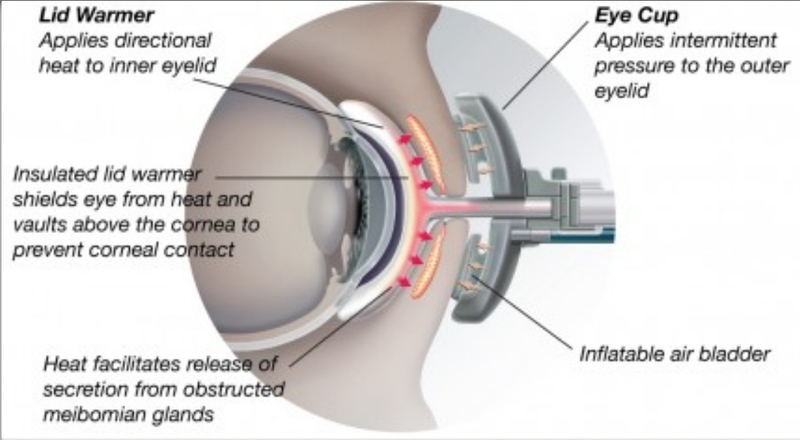 Roholt Eye Center in Canton, Ohio is very progressive and using advanced techniques for dry eye. I would highly recommend them. After being treated for dry eye for 10 years with some, but not enough, relief, I have found Roholt and have renewed hope as they have added treatments and medications I feel are promising. Sorry, that’s a quote from here: http://www.dryeyezone.com/talk/showthread.php?6613-Meibomian-gland-dropout-atrophy. No names provided.